I have mentioned a couple of times recently that I have been having some niggling issues with my right calf muscle. It hasn’t really stopped me from completing any of my runs in the last few weeks but it has been noticeably sore after my longer and harder runs. I have been using a bit of ice and pestering my partner for some massage to ease to the discomfort. After my long run last Thursday it was sore and I decided to book myself into the Physiotherapist for her to have a look and let me know what is going on. Unfortunately, my appointment today revealed a small strain or tear of my right calf muscle which will need some time away from running to repair itself. 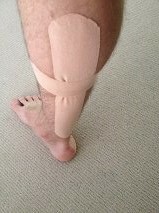 The Physio treated me with some Ultra Sound and massage and taped my leg to assist the healing. I must say it’s a little bit of a downer in week two of my marathon program to be injured but not entirely unexpected as I knew something wasn’t quite right. The good news is I have not done too much damage and I should be able to resume some running next week if there is no pain while doing some stretching and extending of the calf itself. How it happened? I believe it happened after I gave myself a week off training around Christmas time and then went straight back into a hard week of training afterwards. My mind was obviously raring to go but perhaps my body needed a bit of time before we leapt into heavy training. My marathon program that was to be 13 weeks will now be adjusted to 10 weeks. I will need to be careful not to overdo things in the first few weeks back, meaning the last eight weeks will be where all my longer runs and important speed sessions are done. The first six weeks of the last eight weeks will now be crucial and then taper for the race. We are still aiming for sub 3. A setback but never the less a minor one and one that we all have to deal with from time to time. As frustrating as a runner not being able to run is there is always a positive. This week I am on leave from work and will now need to spend more time relaxing on the beach instead of running which won’t do me too much harm I am sure. Hope you are healed up soon!